Vivian Gandillon relishes the change, the sweet, fierce ache that carries her from girl to wolf. At sixteen, she is beautiful and strong, and all the young wolves are on her tail. But Vivian still grieves for her dead father; her pack remains leaderless and in disarray, and she feels lost in the suburbs of Maryland. She longs for a normal life. But what is normal for a werewolf? Then Vivian falls in love with a human, a meat-boy. Aiden is kind and gentle, a welcome relief from the squabbling pack. He's fascinated by magic, and Vivian longs to reveal herself to him. Surely he would understand her and delight in the wonder of her dual nature, not fear her as an ordinary human would. Vivian's divided loyalties are strained further when a brutal murder threatens to expose the pack. Moving between two worlds, she does not seem to belong in either. What is she really--human or beast? Which tastes sweeter--blood, or chocolate? 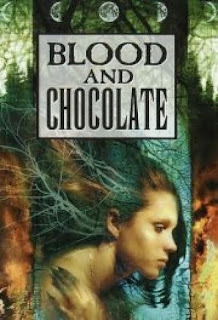 I bought Blood and Chocolate ages ago, and only just picked it up last week. I’m very glad I did, because Blood and Chocolate has become one of my favorite werewolf books of all time. The big kicker with this book is that instead of the fragile human girl falling for the dangerous otherworldly boy, it’s the exact opposite! Vivian is the femme fatal, beautiful and dangerous, who makes Aiden fall for her. I loved that Vivian was strong and willful, doing what she wanted even when it went against everyone in her pack. She followed her heart, even if the outcome didn’t exactly go as she had planned. It was interesting to read this book, because it was one of the more, erm, risqué ones I’ve read in a while. Nothing outrageous, but there are elements that definitely make this book anti-middle school student. But I enjoyed that Klause included these matters and didn’t curb around them as if teenagers are too stupid to understand what they are. The book was well written, and I could easily get into Vivian’s head. Take away the fact she was a werewolf, and I could relate to her well. She went through normal teenage girl dilemmas: boyfriend troubles, ex-boyfriend troubles, jealousy, heartbreak, and having all the boys ogling her… Okay, well maybe not normal teenage girl troubles, but it happens. I give this novel 4 out of 5 stars. I've never heard of this book, but you make it sound very compelling. I might just have to pick it up! Glad you liked it! This was one of the first werewolve books on the scene, and it's still on of my favorites. I read this several years ago, and really liked it. Glad you enjoyed.